A new CBS News/New York Times poll finds that six in ten Americans oppose lifetime appointments for Supreme Court justices, with respondents agreeing with the idea that such appointments give the justices too much power. Respondents were asked this question: "Which opinion comes closer to your own appointing Supreme Court Justices for life is a good thing because it helps keep them independent from political pressures, or appointing Supreme Court Justices for life is a bad thing because it gives them too much power?" Just 33 percent said they believed lifetime appointments are a good thing because it keeps justices independent. Sixty percent said they disapprove of lifetime appointments. Three in four said they believe the current Supreme Court justices sometimes let their own personal or political views influence their decisions. The belief crossed party lines, with roughly the same percentage of Republicans, Democrats and independents expressing that view. Only 13 percent said the justices decide cases based solely on legal analysis. Asked specifically how the justices will decide the challenge to the federal health care law passed in 2010, 55 percent said they will be influenced by their personal or political views. Thirty-two percent said the decision will be grounded strictly in legal analysis. Overall, more Americans approve than disapprove of how the Supreme Court is handling its job, though the court's overall job approval rating is less than 50 percent. 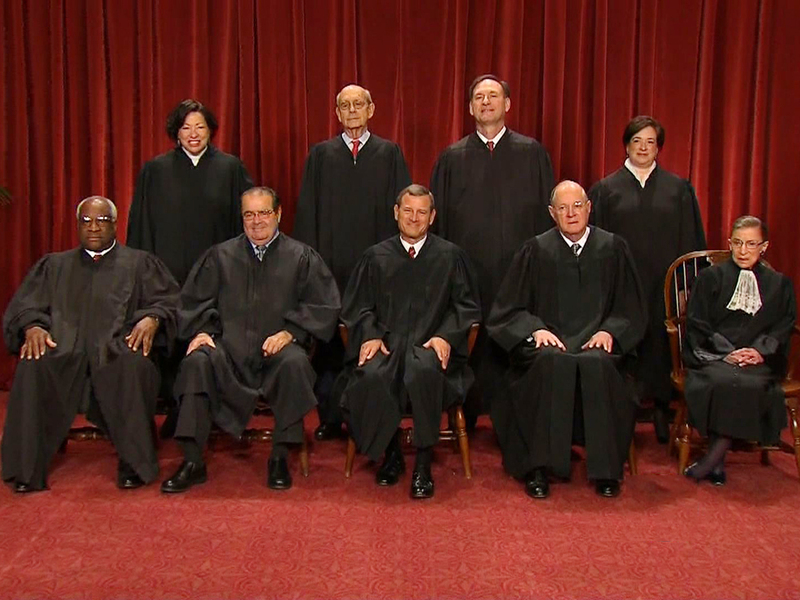 Forty-four percent - including 51 percent of Democrats - approve of the way the justices are performing. Thirty-six percent disapprove. Another one in five doesn't have an opinion. Far worse are perceptions of Congress. Just 15 percent of Americans said in the CBS News/New York Times poll that they approve of the job Congress is doing, while 77 percent disapprove. Those numbers are actually slightly improved from February, when only 10 percent approved of the job Congress is doing. Poll: Most Americans think Arizona immigration law is "about right"
This poll was conducted by telephone from May 31-June 3, 2012 among 976 adults nationwide. Phone numbers were dialed from samples of both standard land-line and cell phones. The error due to sampling for results based on the entire sample could be plus or minus three percentage points. The error for subgroups may be higher. This poll release conforms to the Standards of Disclosure of the National Council on Public Polls.